The long wait is over, and the Jeep Gladiator truck has finally made its way to Ohio. This is the Jeep pickup truck that automotive enthusiasts have been anticipating for months and even years in some cases. The Gladiator is incredibly similar to the Jeep Wrangler, but it gives you the versatility and capabilities of a pickup truck. You still get your favorite Jeep features, like the removable top and the latest Uconnect infotainment system. But the 2020 Jeep Gladiator comes in an all-new package. To say that the Jeep Gladiator is capable is an understatement. The Gladiator follows expectations from the brand, delivering the Jeep 4×4 capability that the brand is known for in a new body style. You can drive the Gladiator anywhere, including the off the beaten path while hauling and towing your gear with you. The Gladiator has multiple qualifiers that set it apart from the rest of the class, including that it is the only open-air pickup truck that you will find – anywhere in the automotive industry. Jeep worked hard to develop the Gladiator, engineering it from top to bottom to maximize capabilities. The result is a vehicle that has best-in-class abilities, both for towing and payload. When towing with the Gladiator, you can tow along as much as 7,650 pounds, perfect for your trailer filled with ATVs or your boat. This way, you do not have to leave gear behind on your next adventure. The best-in-class payload from the Gladiator is 1,600 pounds. To make the most of that payload capacity, the Jeep Gladiator always comes with a three-position tailgate. You can further customize the truck bed with a roll-up tonneau cover or a 115-volt power outlet to power your outdoor adventures. Speaking of the Gladiator’s capabilities, this Jeep is the most off-road capable midsize truck ever to exist. You get Dana 44 rear and front axles of a heavy-duty nature and the Jeep 4×4 system with high as well as low range. Depending on the trim you choose, the Gladiator also comes with an electronic disconnecting front sway bar, lockable wide track axles, 33-inch all-terrain tires, and FOX shocks. It even offers another industry-exclusive, the TrailCam Off-Road Cam that faces forward and helps you get around obstacles when off the road. The Jeep Gladiator has the latest Jeep features, including the option of the Uconnect 4C NAV system with its largest-in-class 8.4-inch touch screen. Going with this screen includes navigation, Android Auto, and Apple CarPlay. The Gladiator also stands out with some other smart features, like the industry-exclusive Bluetooth wireless speaker that you can remove. For that feeling of luxury, consider going with leather-trimmed seats for the Gladiator’s cabin. You can also enjoy as much or as little fresh air as you want when driving the Jeep Gladiator since it is the only open-air pickup truck. Go with either the hard top or the soft top, depending on your preference. You can also remove all four of the Gladiator’s doors and fold down the windshield in addition to opening your pickup’s roof to maximize the fresh air. 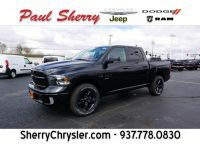 When it comes time to buy your all-new Jeep Gladiator, Sherry Chrysler is the best choice in Ohio. Our dealership has a long history of providing Ohio drivers with high-quality vehicles and excellent customer service. We will work with you to ensure that you get the Gladiator you want. Since this is a new model, we understand that information is still limited, and there is less general knowledge about this Jeep pickup. Our patient and knowledgeable team will go over the four trim levels with you to help you select the right one. We will also gladly assist you with financing and arrange a test drive, so you can experience the Gladiator before you commit to purchasing it. We know you will love the Jeep Gladiator as much as we do and cannot wait for Ohio drivers to start experiencing it.